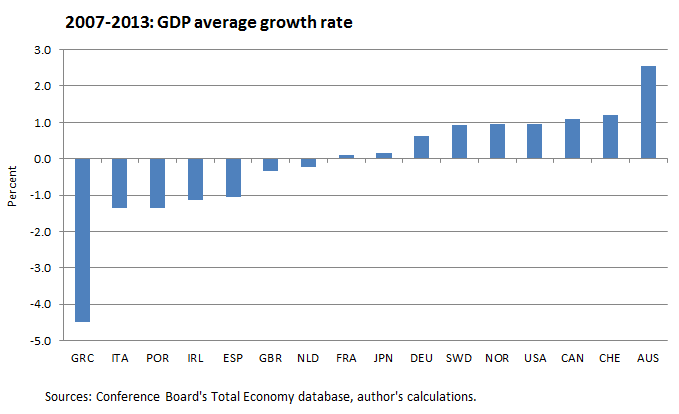 Australia, Switzerland, Canada, and the U.S. posted the fastest growth, whereas the GIPS were the weakest. How was growth split between the increases in labor quantity and labor productivity? Once again, the GIPS shed the most labor, whereas Australia, Switzerland, Norway, and Canada added the most. (Notice that three of the top four are commodity economies.) 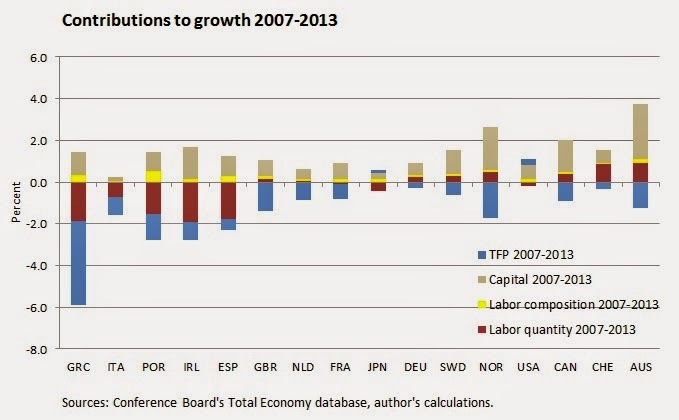 In the U.S. total labor input decreased between 2007 and 2013 (although much less than in the GIPS). 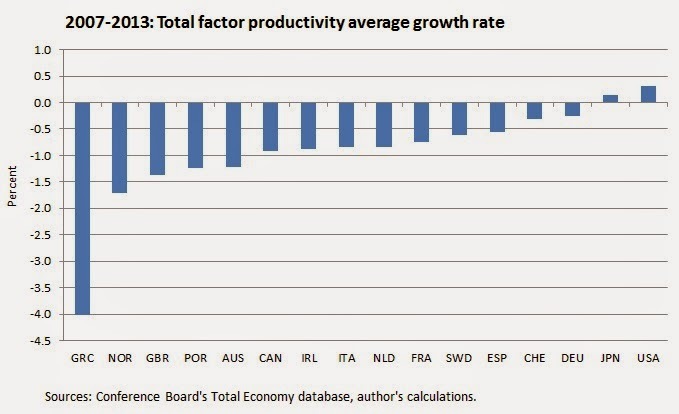 On productivity, Australia is still among the top performers, and so is Canada. 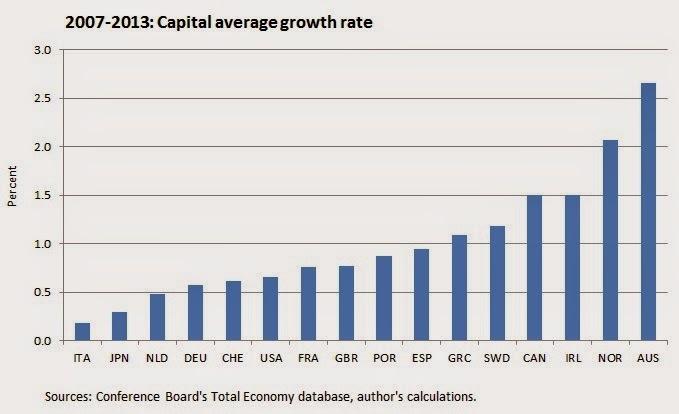 But here the news is that two of the GIPS (Ireland and Spain) are near the top, along with the U.S. In Italy and Greece productivity declines sharply, and so does in the U.K. This feature of the U.K. recovery (relatively small job loss, and massive declines in productivity) has been covered several times by the FT. Productivity growth can further be decomposed into the contributions of: changes in labor composition (essentially, changes in the education of the employed), capital additions, and "dark matter" (also known as total factor productivity). 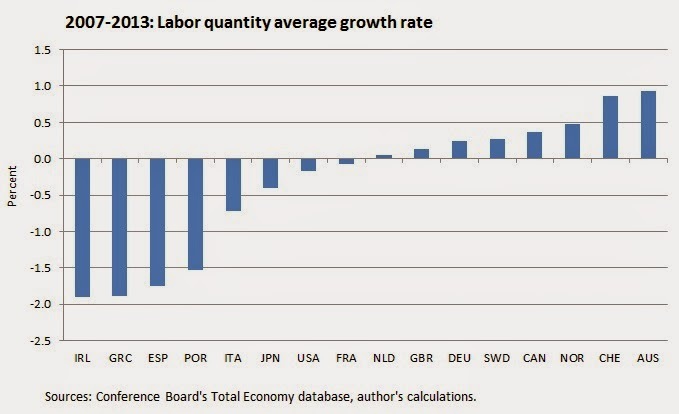 Portugal, Greece, and Spain improved the quality of their employed the most, whereas Italy did so the least. 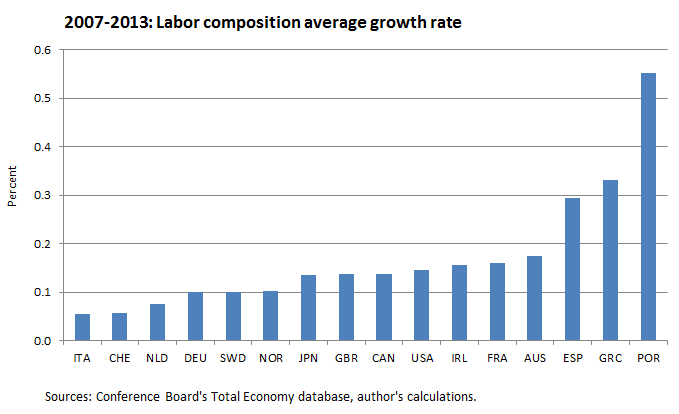 The labor composition didn't make a negative contribution to growth anywhere. The contribution of capital (the sum of ICT and non-ICT capital) was also positive in every country, and was largest among commodity economies, as well as Ireland. Greece here is number six. Italy is once again last. TFP contributed the most to growth in some of the richest economies (U.S., Japan, Germany, Switzerland) and the least in Greece, Norway, U.K., and Portugal. 1) Output growth was fastest among commodity economies (Australia and Canada), as well as the U.S. and Switzerland, thanks to generally growing labor input (or a small loss, in the U.S.), fast growth of capital, and some growth of TFP in the U.S.
2) Labor composition (the "quality" of labor) added to growth everywhere, whereas total factor productivity was negative everywhere except in the U.S. and Japan. 3) Southern European countries lost the most employment. 4) Productivity shrunk by a massive amount in Greece. 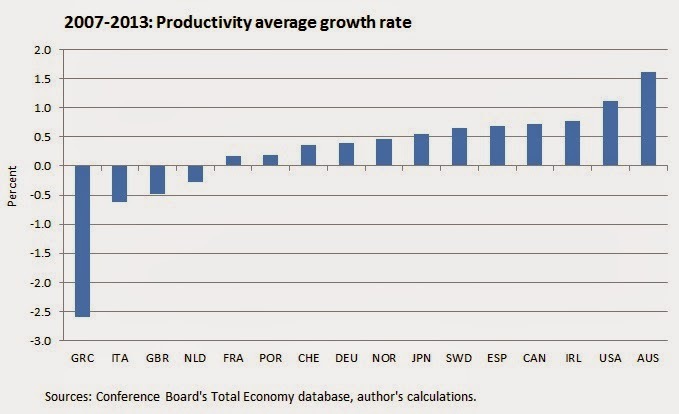 Italy, the U.K., and the Netherlands also saw their productivity decline.